Modern dental advances provide a host of options for replacing missing teeth-from traditional dentures to dental crowns & bridges (metal ceramic and metal free ceramics) to the latest dental implants. Dental bridges are meant to replace missing teeth by “bridging” the gap between two remaining teeth. This involves creation of a pontic, or false tooths with a dental crown on either side. The dental crowns are fitted over the remaining teeth to hold the false tooth in place. Q) What are the types of Dental Crowns available in India? 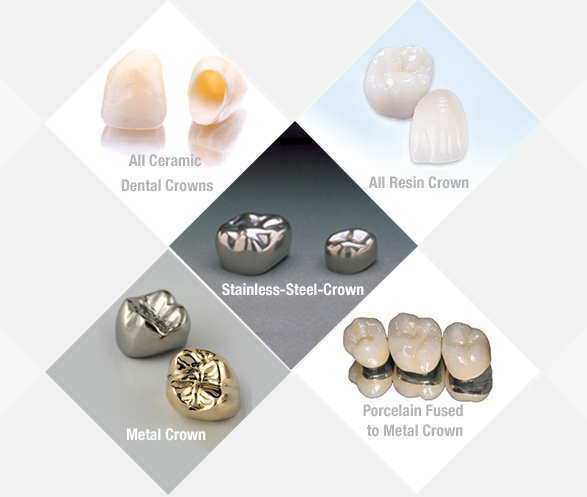 (a) All Metal Crowns: These are made of an alloy of various metals. Very durable but highly unaesthetic as they are silver in colour. Not recommended in front teeth. (b) Porcelain fused to metal Dental Crowns: These dental crowns have a metal backing & have a layer of ceramic fused all over. Metal backing gives strength & ceramic gives it a natural tooth like appearance making it highly aesthetic. 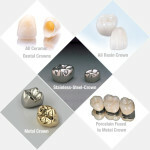 (c) Metal Free Ceramic Dental Crowns / Porcelain Dental Crowns:These crowns are made completely out of porcelain. They can look very natural and are most often used for front and back teeth. (d) Zirconia Crown: The most popular type of all-ceramic crown which is worn to improve the appearance of a tooth which has become stained or disfigured over the years.Zirconium crowns are more robust than porcelain crowns. They last longer too, compared to porcelain that chip and break. Q) How much does dental crowns cost in India? A)Depending on where the dental crown is being placed, the number of dental crowns being placed, and the material of the dental crown, the cost of dental crown vary from Rs.1000 to Rs. 15000 per crown. Q) What are the types of Dental Bridges available in India? (i) Conventional bridges-These dental bridges are used only when there are sound teeth on both sides of the missing teeth for providing necessary support to the dental bridge. (ii) Resin bonded bridges-They are mainly used for replacing the front teeth. These dental bridges have a metal band that firmly bonded to the adjacent teeth, and will provide necessary support to the replacement teeth. However, they cannot be used for replacing the back teeth due to strong forces generated by chewing action. (iii) Cantilever bridges-These dental bridges are used when there is no sound tooth for support on one side, as in the case of missing last molar. These bridges are also preferred for missing tooth in the front portion, as it is possible to take support from back tooth. In this ways, any changes in sound front teeth can be avoided.